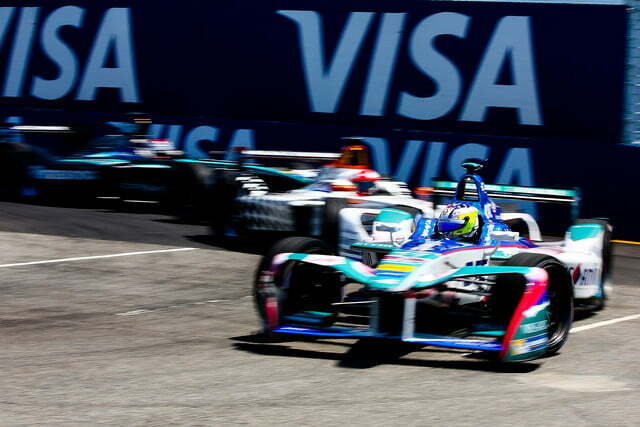 Is Formula E the future of racing, or just a flash in the pan? The auto industry is in a state of flux. If the predictions from scores of pundits and analysts come true, autonomous electric cars will soon become the norm, whisking people silently from place to place in a soulless but efficient fashion. That may sound like heaven for the average Los Angeles commuter, but for the average car enthusiast, it sounds like hell. But these new technologies can bring positive change for car fans as well. 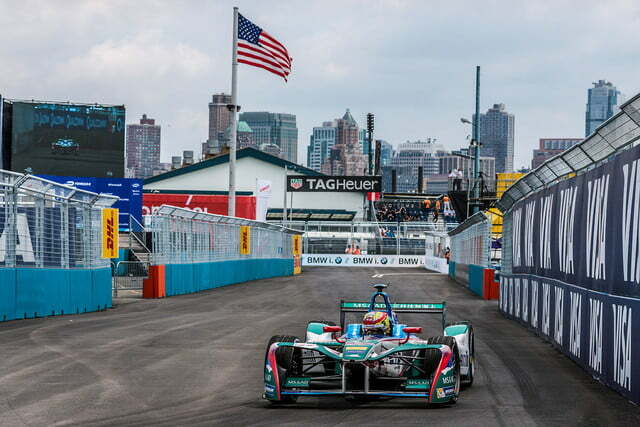 Thanks to electric powertrains, a crowd of 20,000 people recently got to watch a race in New York City, within sight of the Statue of Liberty. Drivers went wheel to wheel in Formula E electric cars, which are quiet enough to operate in urban areas and don’t pollute the air with exhaust emissions. Formula E is unlike any other form of racing, and not just because of the electric cars. In Formula E, efficiency, fan engagement, and relevance are just as important as speed, horsepower, and lap times. But the ultimate goal remains the same: to win. The promise of a new form of racing attracted one of the most established names in motor sports. Andretti Autosport is the race team of Michael Andretti, son of Mario, and an accomplished racer in his own right. The team races in the IndyCar series and rallycross, and joined Formula E when the series started up in 2014. Andretti opened its garage to Digital Trends for a behind-the-scenes look at Formula E technology during what is officially known as the New York City ePrix. 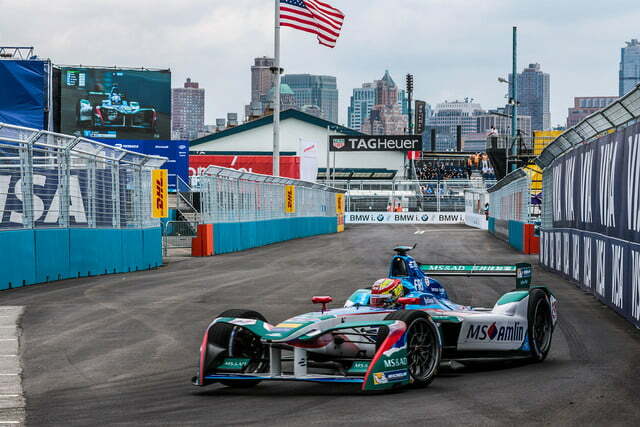 Thanks to electric powertrains, a crowd of 20,000 people got to watch a race in New York City. Many race series pay lip service road-car relevance, but the companies supporting teams like Andretti in Formula E genuinely seem to believe that technology developed on the track can be applied to cars people will eventually buy. 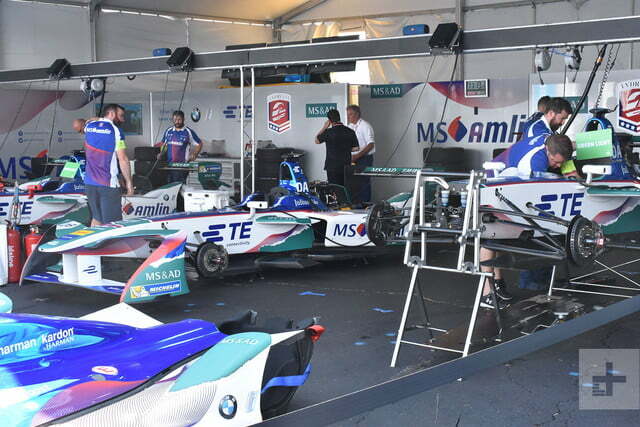 Andretti has a technical partnership with BMW, which will supply powertrains beginning next year. It’s also backed by Harman, which supplies audio systems and connected-car tech to BMW and a host other automakers. But for now, Formula E has to deal with the realities of electric cars and the need to encourage competition before it can fulfill those promises. While some fans follow racing for the speed and skills of the drivers, engineering nerds like to obsess over the tricks and tweaks teams use to make the cars go faster. But in Formula E, there actually isn’t much of that. Opportunities for innovation are concentrated around the electric powertrain, with virtually everything else restricted by the rules. All teams use the same chassis, which is built by a company called Spark Racing Technology. This is meant to keep costs down, and to keep development efforts focused on the powertrains, rather than aerodynamics, which has come to define more traditional race series like Formula One. The 28-kilowatt-hour battery pack is both literally and figuratively a black box. Teams can’t modify it, just bolt it to the chassis and add their own inverters, motors, and gearboxes. The fear of rivals catching a glimpse of these parts is so great that Andretti asked us not to photograph the back halves of its cars while they sat in the garage. 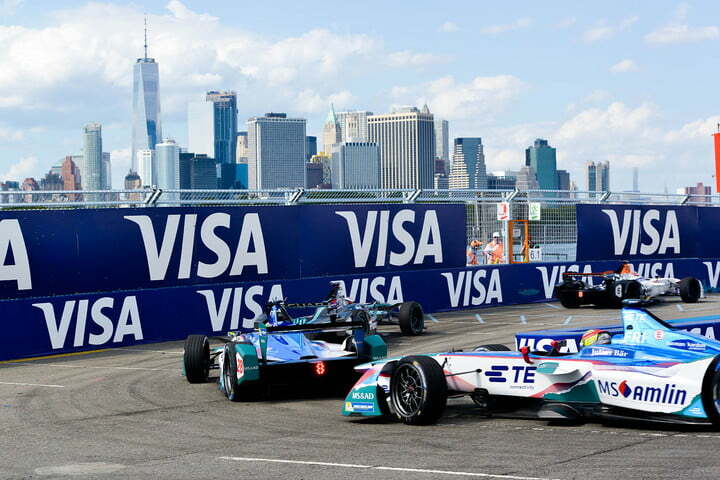 Formula E is unlike any other form of racing, and not just because of the electric cars. 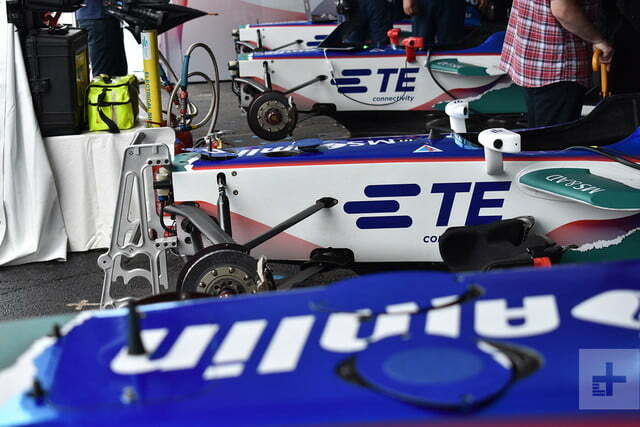 “It’s really a spec series at the moment,” Judith Henzel, an engineer with supplier TE Connectivity who is embedded with the Andretti team, told us. Engineers try to get the most out of the setup by analyzing data, which is “even more important than with a combustion engine,” Henzel noted. The series “will be more open in the next two to three years,” she said. Teams are particularly looking forward to a battery upgrade due for Formula E’s fifth season (2018-19) that will allow cars to run an entire race on a single charge. 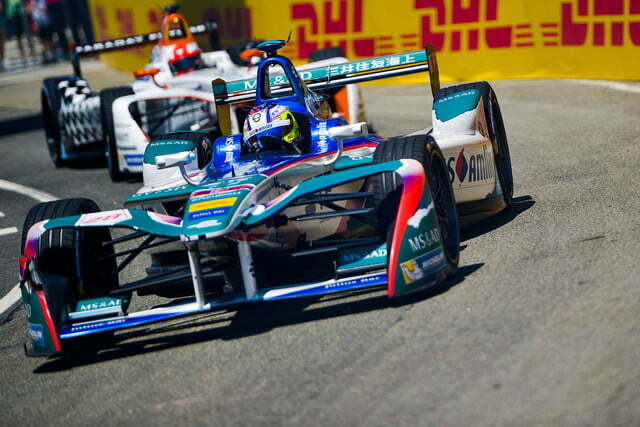 Right now, cars can make it through only half of each race on a full charge. 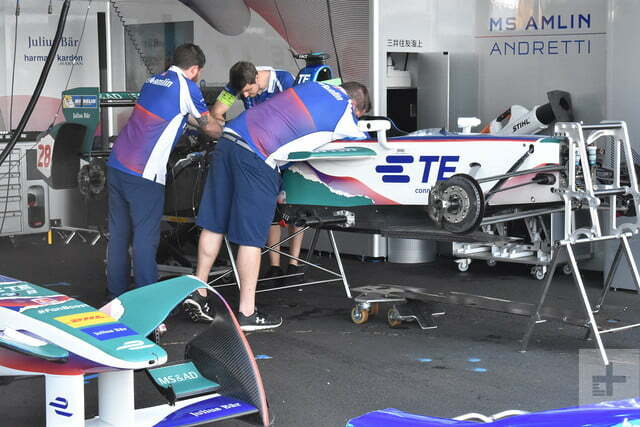 While in other series drivers pit for fresh tires or fuel, in Formula E they change cars. It shows that being on the cutting edge of technology sometimes requires compromises. “It’s a lot different from running a normal gasoline car,” said Andretti team manager Rob Arnott. 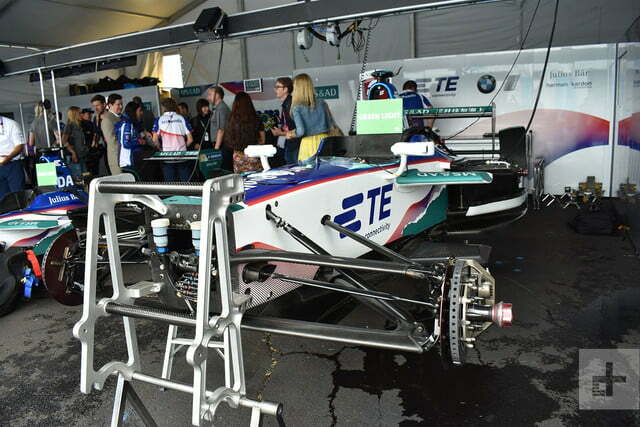 For one, the battery packs make Formula E cars pretty heavy. With minimal bodywork and only a tiny cockpit for the driver, Andretti’s red-white-and-blue machines look similar to other open-wheel race cars. But at 880 kilograms (1,940 pounds) they weigh significantly more. The battery pack alone weighs 650 pounds. 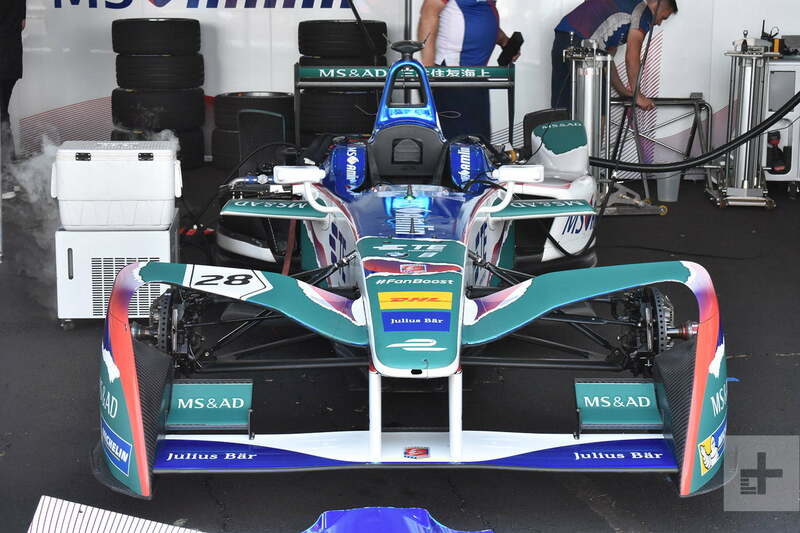 With 200 kilowatts (268 horsepower) of power in qualifying trim and 170 kW (227 hp) in race trim, a Formula E car still do 0 to 62 mph in about 3.0 seconds, and reach a top speed of 225 kph (139 mph). The battery pack also generates a lot of heat. In between sessions, teams pack dry ice around the cars to cool them down. While the car is running, the battery, motor, and inverter are cooled by radiators filled with dielectric fluid. It’s safe to use even in the vicinity of high-voltage current. 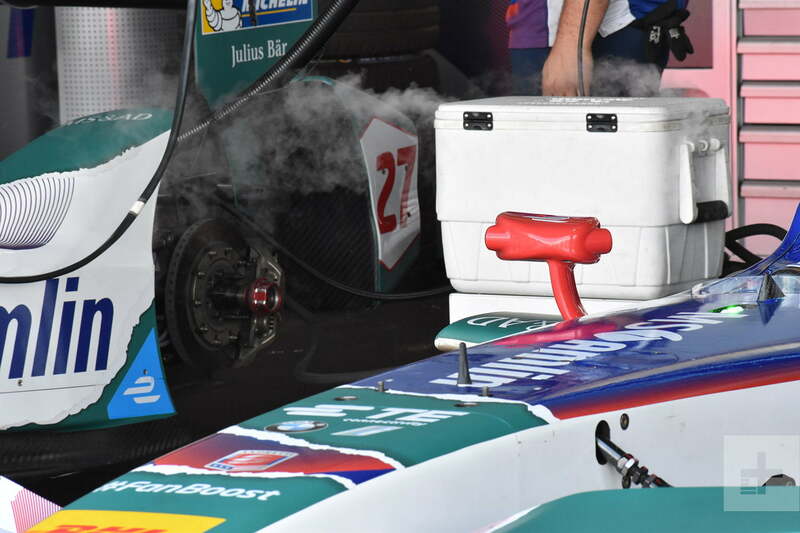 “The last couple of laps, we might have to back out,” said Arnott of the danger of overheating. “Because if too much heat [accumulates], it might go into safety mode.” If a driver gets stuck in this limp-home mode, it could cost him the race. If the battery pack needs to be replaced, mechanics basically have to take apart the entire car. 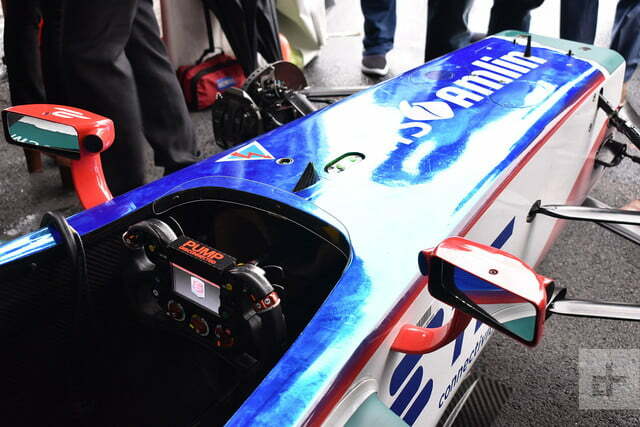 Lift the bodywork off a Formula E car and, as with many other types of race cars, there is no structure aft of the cockpit. The battery pack bolts directly to the rear bulkhead of the cockpit, and everything else bolts to the pack. 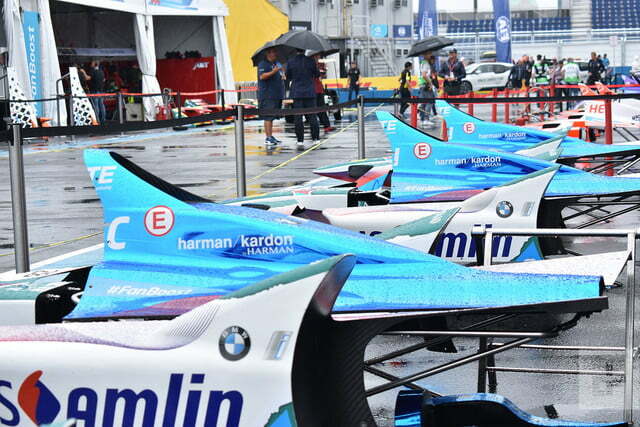 Formula E is probably the only major race series where saving energy is as important as going fast. Disassembling a car isn’t just a pain in the neck, it’s also potentially dangerous. While race mechanics are used to the problems that hot metal and flammable fuel can cause, electric cars require a completely different set of precautions. Looking like a B-movie mad scientist, we watched a mechanic approach the car in oversize rubber gloves and a plastic face mask. Another stood nearby with a large hook, which is used to pull the person working on the car away if he or she gets electrocuted. Hooray for teamwork. Formula E presents new challenges for drivers as well. It’s probably the only major race series where saving energy is as important as going fast. Drivers have specific energy targets they must meet, explained Henzel, the TE Connectivity engineer. 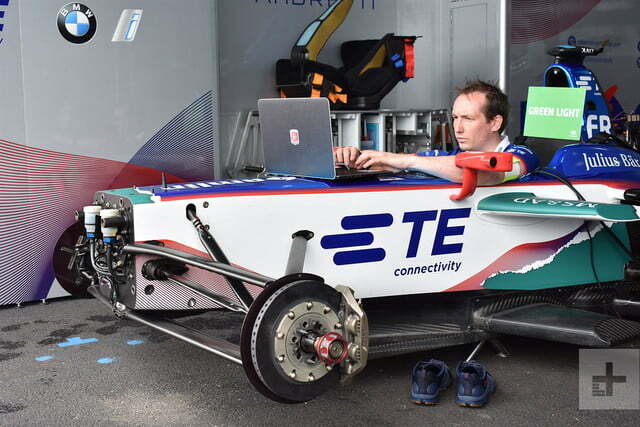 During the race, they’ll be asked to switch to different software maps that control things like power output and brake bias, as engineers try to squeeze every bit of energy they can out of the car. It’s hard to imagine a race driver being happy doing anything but going as fast as possible, but Formula E juggles a lot of issues. Even the Michelin Pilot Sport EV2 tires every team uses were designed not for maximum grip but to provide low rolling resistance and, in turn, increased efficiency. Michelin is happy because these tires are closer to the ones used on production cars than normal racing tires, and Formula E organizers believe the lack of grip makes the racing more dramatic. Who knew tires had to do so much? Thankfully, all of the behind-the-scenes politicking and rule-making doesn’t affect the quality of the racing. Despite the unusual location, the electric powertrains, and the strict rules, the only real difference from the stands was the lack of noise. It does take an element of drama out of the racing, but at least you don’t have to wear earplugs. Formula E has the potential to keep cars fun and exciting in a zero-emission future, but it hasn’t reached that potential just yet. The series is off to a strong start and, with some refinements—like bigger battery packs and letting drivers focus more on driving and less on saving energy—it could be even better.